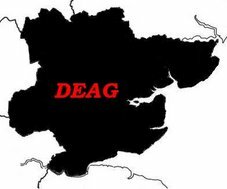 Happy New Year from DEAG. Seven of us met up on Thursday 17 Jan at our secret base in Darkest Essex, the hot topic this time being the Golden Jubilee Challenge. Several of us are going to enter and some have made a start whilst others are still in the planning stage. More information will follow as to our progress. David (S) proudly produced his Assoc. 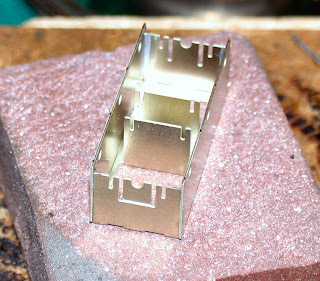 08 kit which had recently arrived and made a start, putting the chassis jig together, see below. Nick was working on some 'Electra' couplings for his rolling stock which as usual looks so neat, he rarely gets blobs of solder on things, I'm jealous! Bill was working on some wagon chassis for his Long Melford layout, too big for the Challenge unless he enters one baseboard on its own. I was also finishing some wagon chassis to go under more (7 plank) coal wagons for my planned Forest of Dean Layout. 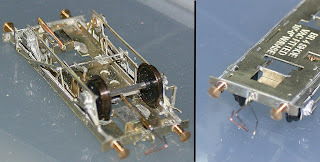 Stewart showed us how to make three link couplings, two brass links and one steel, for his automatic coupling system. So far he has been able to pull six wagons without them coming apart so the system looks promising. Uncoupling has still to be perfected but several ideas are being tried and Stewart has promised to put something on the blog soon. 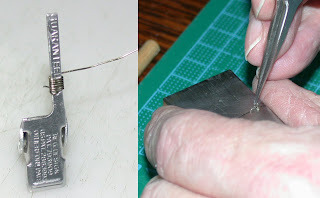 The picture on the left shows his link winding jig made from an aluminium hair clip and the other picture shows the links being fitted together. Takes patience this hobby! 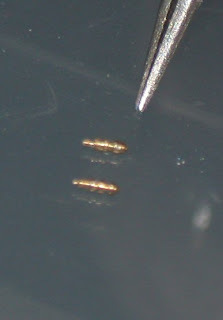 The final photograph shows two whistles that Nick has turned out of brass rod for Stewart, I think they are about 3mm long! Our next meeting will take place on 21 February, if you would like to join in, contact details can be found in the 06/07 Yearbook.